We're creating an Area Redevelopment Plan for Inglewood-Ramsay to guide development and growth in the communities and station areas near the new Green Line LRT. 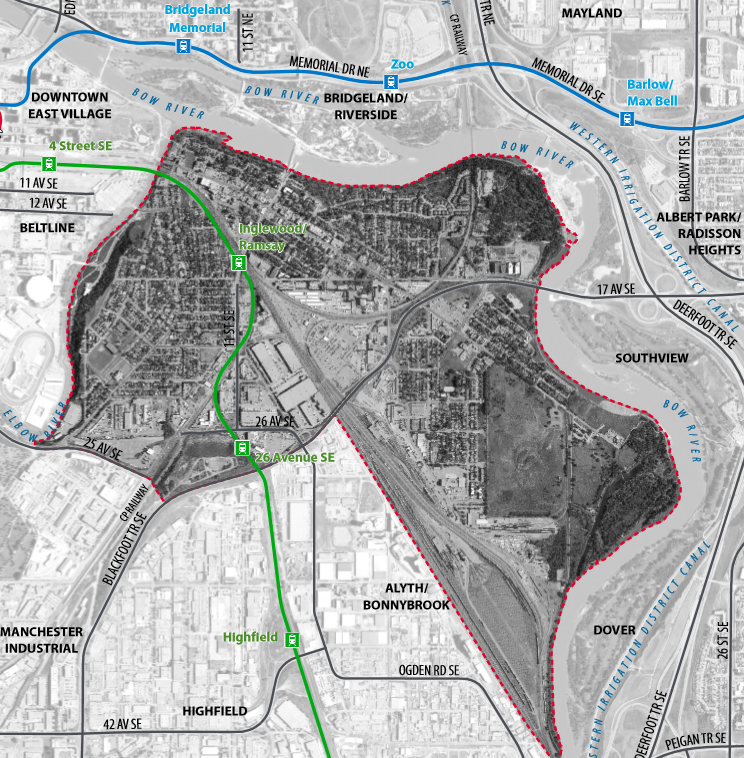 In early 2018, The City of Calgary decided to merge the draft Area Redevelopment Plans (ARP) for the communities of Inglewood and Ramsay. As part of this process, facilitated discussions will be taking place to gather stakeholder input on the merged draft document. B&A Planning Group has been contracted by The City as an independent consultant to guide a public engagement process aimed at collecting feedback from all stakeholders. The goal for the engagement is to gather input to create meaningful recommendations for policy contained in the revised Historic East Calgary Area Redevelopment Plan (HEC ARP). Please join us for the next public event on Wednesday March 13, at the Alexandra Centre Dance Hall. Two sessions are being held that evening to provide more opportunity for participation. Please register for only one session, as both sessions will cover the same information and topics. The events are working sessions, so attendees are encouraged to arrive on time and attend the entire session. The goal for the interactive sessions is to gather input on key topics that can feed directly into recommendations for policy contained in the ARP. First Session will be held Wednesday March 13, 5:00 p.m. to 6:30 p.m.
Second Session will be held Wednesday March 13, 7:30 p.m. to 9:00 p.m. Registration for the event is required. Registration is limited to venue capacity and on a first-come first-serve basis, please register early to avoid disappointment. Please register for only one session, as both sessions will cover the same information and topics. If you are unable to attend but would still like to participate, please reach out to mmcclary@bapg.ca. Depending on the level of interest additional events may be added. We look forward to working with all interested stakeholders. Please click on the buttons below to register for the session of your choice. A Town Hall was held on Wednesday, January 23, 2019 at the Alexandra Centre Dance Hall, 922 - 9th Avenue S.E. To watch the video recordings of the January 23 Town Hall please click through the links below. In October 2018, City Council approved a request from Administration to defer the Inglewood-Ramsay, Millican-Ogden and South Hill local area plans. The deferral ensures that additional amendments being made to the Developed Areas Guidebook are reflected in the local area plan and that further engagement with communities, planned for later in the fall, can be coordinated. Additionally, the new plan for Inglewood and Ramsay will be known as the Historic East Calgary Area Redevelopment Plan (HEC ARP) to reflect the historic importance of this area to our city. As a part of this process, facilitated discussions will be taking place in 2019 to gather stakeholder input on the merged draft document. B&A Planning Group has been contracted by The City as an independent consultant to guide a public engagement process aimed at collecting feedback from all stakeholders. The goal for the engagement is to gather input to create meaningful recommendations for policy contained within the revised HEC ARP. The City of Calgary has been working on a new Area Redevelopment Plan (ARP) for Inglewood and Ramsay which will account for the new Green Line LRT stations. An ARP provides rules and guidance for the type of development that makes sense in a given area – how to complement the local character, what level of density makes sense and how to transition from high to low density, or residential to commercial. It includes policies on land uses, building forms and densities, buildings heights, parks, transportation, contamination and housing. As of Q2, 2018, The City has decided to merge the two draft Area Redevelopment Plans (ARPs) for Inglewood and Ramsay. The new plan area for the merged ARP combines the areas previously covered by the Inglewood ARP and Ramsay ARP. This will allow the two communities to share a basic approach to growth while recognizing individual differences where appropriate. The plans share a lot of common policies and the two communities have been planned as a unit from the start of this process in mid-2015. Click here to view the draft ARP. The City of Calgary has been engaging on this project since 2015. To review past engagement summaries and what we have heard. Please click through the reports provided in the Document Library on this page. Visit The City's Inglewood / Ramsay Area Projects page to learn more about what's happening in these communities and to sign up for email updates. Second Session – 7:30 p.m. to 9:00 p.m.
Register at links provided in upcoming engagement section. Additional engagement to help refine and finalize Draft ARP. To Planning and Urban Development Committee and then City Council.